Jardin des Serres d’Auteuil – Game, Set and Match! OVER TWO WEEKS BETWEEN late May and early June around half a million people will make their way to the red clay courts of the Stade Roland Garros at the southern end of the Bois de Boulogne to watch the French Open tennis championships. The French Open is the premier clay-court tennis championship event in the world and the second of four annual Grand Slam tournaments, the others being the Australian Open, Wimbledon and the US Open. This year, the tournament takes place between 22nd May and 11th June during which time the French Tennis Federation (Fédération Française de Tennis) will accrue approximately €200 million in revenue of which around €30 million will be given away as prize money. The Stade Roland Garros was constructed in 1928 to host France’s first defence of the Davis Cup. It takes its name from the pioneering aviator, engineer and World War I fighter ‘ace’, Roland Georges Garros who, amongst many other things, completed the first solo flight across the Mediterranean Sea. Stade Roland Garros is a 21-acre (8.5-hectare) complex containing twenty tennis courts, including three large-capacity stadiums: the Court Philippe Chatrier, the principal court seating almost 15,000 spectators, the Court Suzanne Lenglen, seating 10,000 spectators, and Court 1, seating 4,000 spectators. Across the leafy Avenue Gordon Bennett, directly opposite the Stade Roland Garros, is another space almost comparable in size, the 18-acre (7.2-hectare) Jardin des Serres d’Auteuil, which, along with the Parc de Bagatelle, the Parc floral de Paris, and the Arboretum de l’École du Breuil, make up the Jardin botanique de la Ville de Paris, a collection of four gardens maintained by the city each with their own history and architectural and botanical heritage. The Jardin des Serres d’Auteuil was created in 1761 under Louis XV and is arranged around a parterre in the traditional French style. 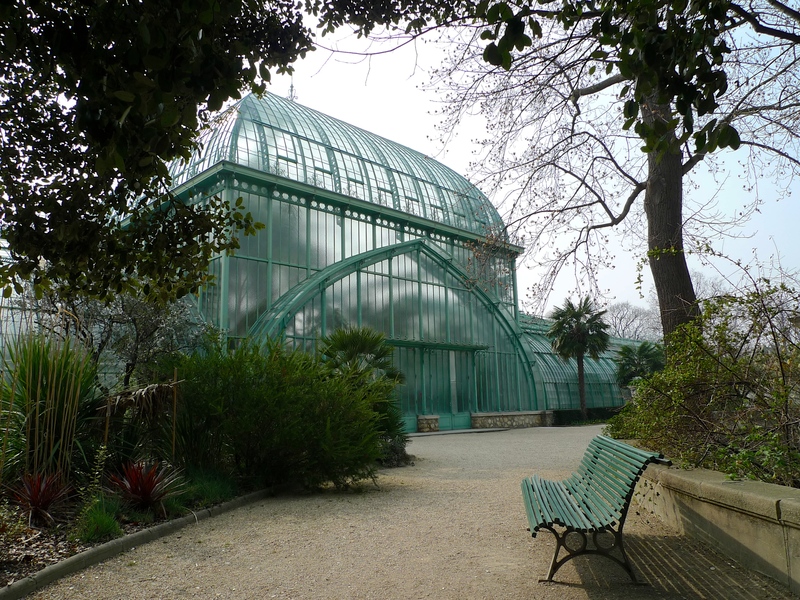 The main greenhouses, designed and constructed between 1895-1898 by the architect Jean-Camille Formigé, were constructed around this central area. 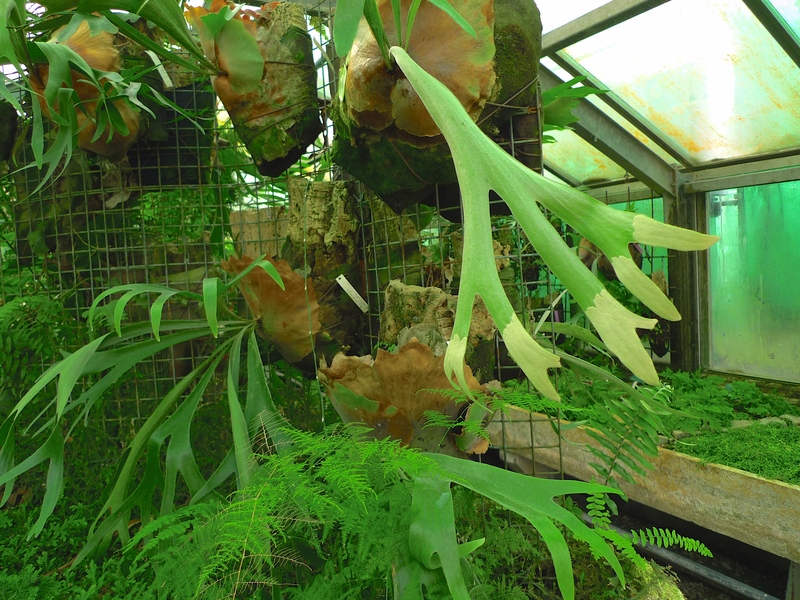 Among the botanical collection are many varieties of plants including azaleas, orchids, begonias, cactus, ferns and some carnivorous plants. 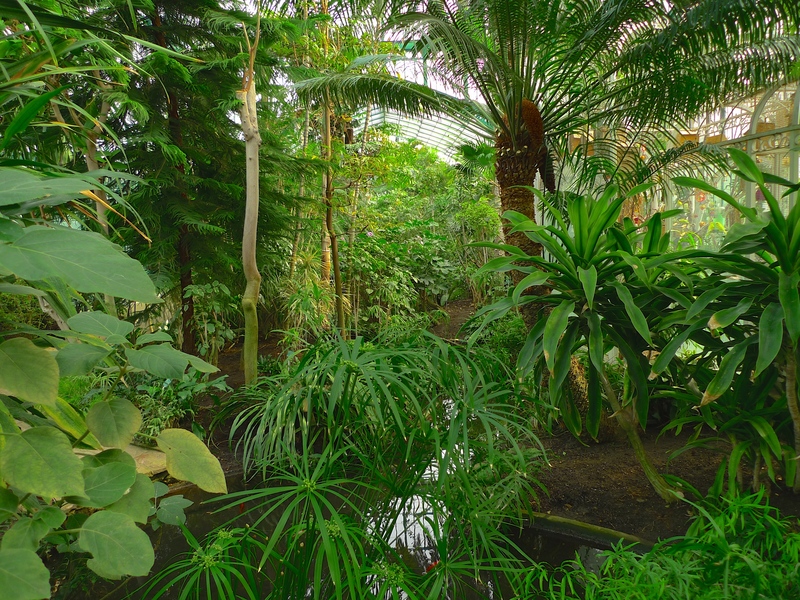 There is also a palm house and an aviary with tropical birds. While most long-term next door neighbours cohabit relatively peacefully, conflict can sometimes break out. After living harmoniously next to each other for almost ninety years, the Stade Roland Garros through its proprietor, the Fédération Française de Tennis, has been locked in conflict over several years with the Jardin des Serres d’Auteuil over a plan to extend the Stade Roland Garros into the historic garden. The Stade Roland Garros is falling behind its Open championship competitors, Melbourne Park in Australia, Flushing Meadows in the United States and Wimbledon in the United Kingdom, in terms of the space and facilities required to stage a Grand Slam tournament. In order to compete and to satisfy the International Tennis Federation, the governing body of world tennis, and to satiate the inexhaustible appetites of the corporate sponsors and the media, the Stade Roland Garros has to improve its offer or risk losing its prestigious Grand Slam status. In 2009 a significant expansion of the Stade Roland Garros was proposed, which included the addition of lights and a retractable roof over the Court Philippe Chatrier. The proposal also called for a new, fourth stadium with a retractable roof and 14,600 seating capacity, along with two smaller courts with seating for 1,500 and 750 to be built at the nearby Georges Hébert municipal recreation area, east of Roland Garros at Porte d’Auteuil. Factions within the Paris City Council scuppered this proposal. This was followed a scheme to move the French Open to a completely new, fifty-five-court venue outside the Paris city limits but the Fédération Française de Tennis scuppered that. In May 2013, the Fédération Française de Tennis announced a proposal to completely rebuild the Court Philippe Chatrier on its existing foundations with the addition of a new roof and lights, together with the demolition of Court 1. To replace the demolished court the proposal called for a 5,000-seat, semi-sunken stadium to be built in the southeast corner of the Jardin des Serres d’Auteuil. Here are two photographs I took from a Fédération Française de Tennis publicity banner showing the ‘before’ and ‘after’ effect of their proposed invasion of the Jardin des Serres d’Auteuil. Maybe it’s just me, but the caption in the picture above: Près des serres historiques, un merveilleux geste architectural contribuant au renouveau du jardin botanique de ville de Paris (Near the historic greenhouses, a wonderful architectural gesture contributing to the revival of the botanical garden of the City of Paris), seems to stretch publicity propaganda to the absolute limit – or maybe we have just become so brainwashed that we simply accept ‘alternative facts’ as the norm these days. The sad thing is that these ‘before’ and ‘after’ pictures are no longer just publicity propoganda – they are now a reality. 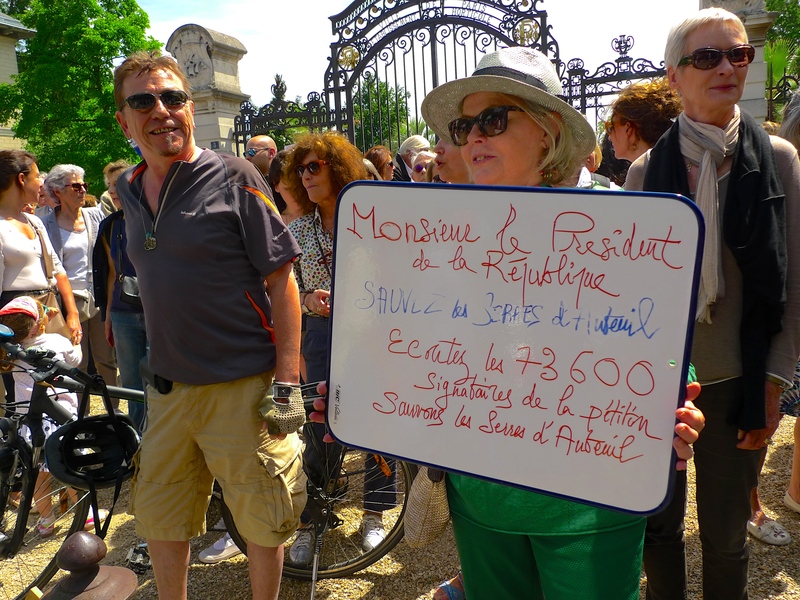 Local residents, municipal authorities, garden and wildlife enthusiasts and others have vigorously opposed the plan to extend the Stade Roland Garros into the Jardin des Serres d’Auteuil. They even came up with a credible alternative scheme, which seemed to gain traction for a time, and they have fought several expensive court cases to try to thwart the ambitions of the Fédération Française de Tennis. But it was the the announcement of the bid by the City of Paris to host the Olympic Games in 2024 that probably sealed the fate of the garden. Integral to the Paris Olympic bid is the new, expanded, Stade Roland Garros. Earlier this month, on the 2nd February, the Tribunal administratif de Paris rejected an appeal against the construction permits previously authorised by the Mayor of Paris and, as a result, the final the green light was given for both the reconstruction of the Court Philippe Chatrier and ‘la construction d’un court de tennis sur une parcelle dans le Jardin des serres d’Auteuil, dans le Bois de Boulogne’. You can read the court’s judgement here. In one of my previous posts I referred to the development in the Jardin des Serres d’Auteuil and how the soundscape would inevitably change as a result. Well, this is today’s soundscape in this once idyllic garden. Of course, developments like this are nothing new, Paris is littered with places revered today built on the ruins of places revered by previous generations. So why should we care about the destruction of some old greenhouses containing a few potted plants when the alternative is a spanking new tennis stadium helping to secure a prestigious Grand Slam tennis tournament in the city and the possibility of hosting the Olympic Games? I suppose some ‘suit’ somewhere has done the calculation: the cost-benefit analysis of keeping or losing a Grand Slam tournament, appeasing corporate sponsors, gaining or losing an Olympic bid, the prestige to the city, the country and of course, to the politicians. It will also be blindingly obvious to our ‘suit’ that there is no long-term monetary cost at all to disfiguring the Jardin des Serres d’Auteuil. After all, a single ticket to the French Open costs between €55 and €2,200 depending on which day and which package you choose (and will no doubt increase substantially when the new facilities are opened) whereas entry to the Jardin des Serres d’Auteuil is currently free. And as a bonus, we will close the entire garden to the general public for the duration of the French Open tournament and reserve it exclusively for our paying customers. What’s not to like? And when it comes down to it, that’s the problem. Costs are easily measured whereas value is intangible and elusive. 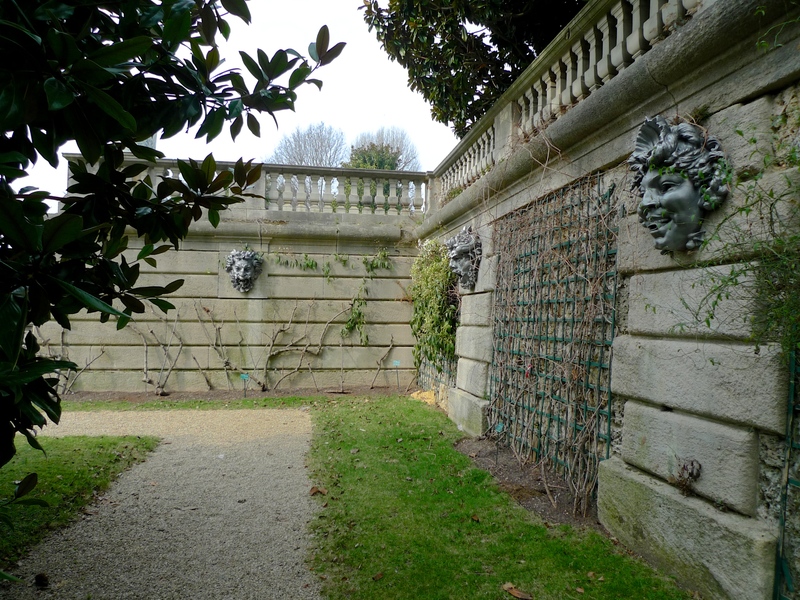 How do you compare the value of an 18th century garden, its original 19th century architectural features and its horticultural collection, not to mention the pleasure it gives to those who visit it, to the money making machine that is the Stade Roland Garros and the French Open tennis championships? Does one have greater value than the other? Should the lust for prestige and profit defeat the preservation of heritage? And to argue, as some do, that only a part of the garden is affected so it doesn’t matter all that much, is akin to arguing that someone is just ‘a little bit pregnant’! Whatever we might think about this garden and the development taking place there, it seems that the Fédération Française de Tennis, assisted by the Mayor of Paris, Anne Hidalgo, and the courts have served an unplayable ace and the umpire has finally called ‘Game, Set and Match’! 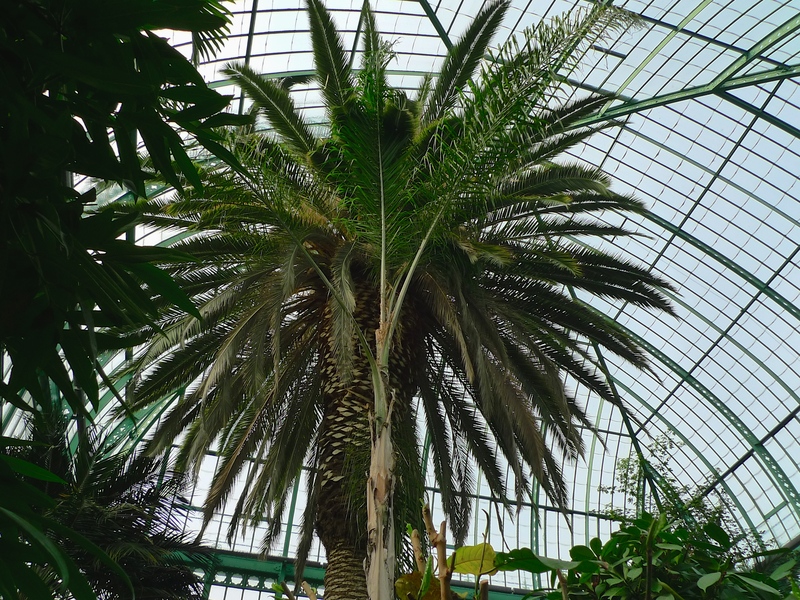 IN MARCH THIS YEAR I published a blog piece about the Jardin des Serres d’Auteuil, the botanical garden set within a large greenhouse complex at the southern edge of the Bois de Boulogne. In that piece I recounted how these gardens, first established in 1761 under Louis XV, are under threat because of plans by the Fédération Française de Tennis to extend the neighbouring Roland Garros international tennis complex into the south east corner of the gardens. 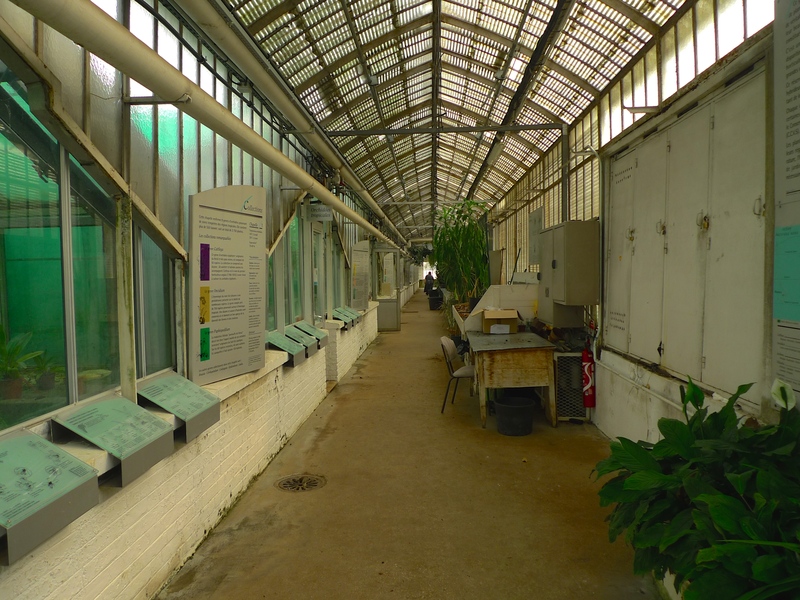 This extension, if it goes ahead, will include the demolition of the nineteenth-century Jean-Camille Formigé greenhouses to make way for a new, semi-sunken, tennis court with seating capacity for 5,000 spectators. At the time of writing my last piece about the gardens the Paris City Council had just unanimously adopted a resolution that a further study into an alternative plan proposed by local residents associations and supporters of the Jardin des Serres d’Auteuil should be conducted by an independent organisation so that the Paris City Council could debate and then vote on it. But now, things have moved on again. Last Wednesday, despite the unanimous resolution of the Paris City Council, the French Prime Minister, Manual Valls, issued a statement instructing Ségolène Royal, the French Minister for Ecology, Sustainable Development and Energy, to sign the Permis de Construire, the building permit required before work on the Roland Garros extension can proceed. So far, Ségolène Royal has not done so. On Sunday afternoon, as Stanislas Wawrinka and Novak Djokovic were locking horns on the Philippe Chatrier court in the Men’s Final of the French Open Tennis Championship at Roland Garros, friends and supporters of the Jardin des Serres d’Auteuil were making their voices heard at the entrance to the gardens on the avenue de la porte d’Auteuil. The recently opened Fondation Louis Vuitton, the privately financed modern art gallery designed by Frank Gehry, has, with government acquiescence, encroached on to what was supposed to be an environmentally protected part of the northern Bois de Boulogne. The government claims to have conceded to the choice of site because of the prestige the gallery brings to the city. In the southern Bois de Boulogne the Fédération Française de Tennis claims that retaining the prestigious French Open Tennis Championship at Roland Garros depends upon extending their facilities and that the only credible plan is to extend into the Jardin des Serres. In addition, France intends to bid for the 2024 Olympic Games and it is claimed that, as part of that bid, an extended Roland Garros is essential. Undoubtedly, a Frank Gehry designed modern art gallery, the French Open Tennis Championships and the Olympic Games are smothered in prestige, probably adding millions if not billions to the economy. But one is surely entitled to ask, at what cost? Imagine a desecrated Jardin des Serres with a semi-sunken tennis court with seating capacity for 5,000 spectators standing empty and completely unused for fifty weeks of the year. The cost of that would not be measured in millions or billions of Euro’s but in a more intangible and equally important currency, what the French call patrimoine, our heritage, the value of which lies in our hearts not in our pockets. My thanks to Lise Bloch-Morhange for taking time out of her very busy afternoon to stop and record these comments. 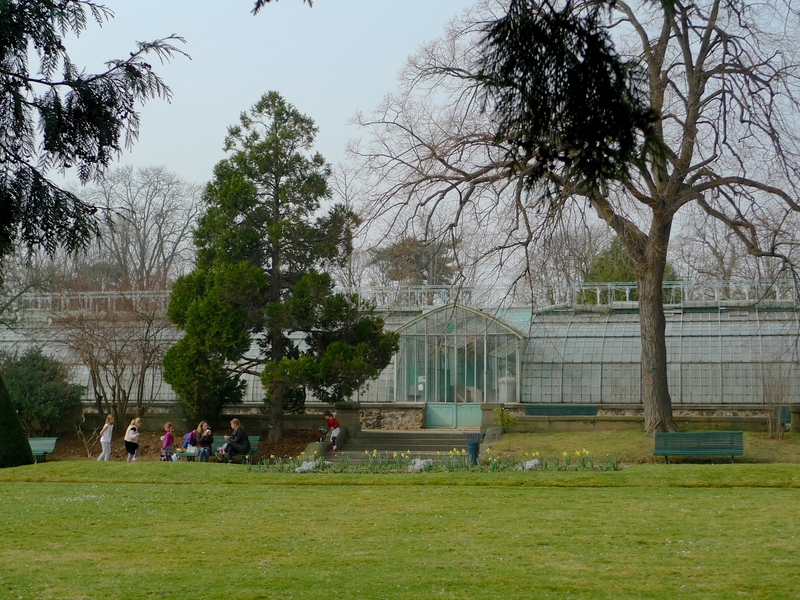 The Jardin des Serres d’Auteuil – Vanishing Sounds? 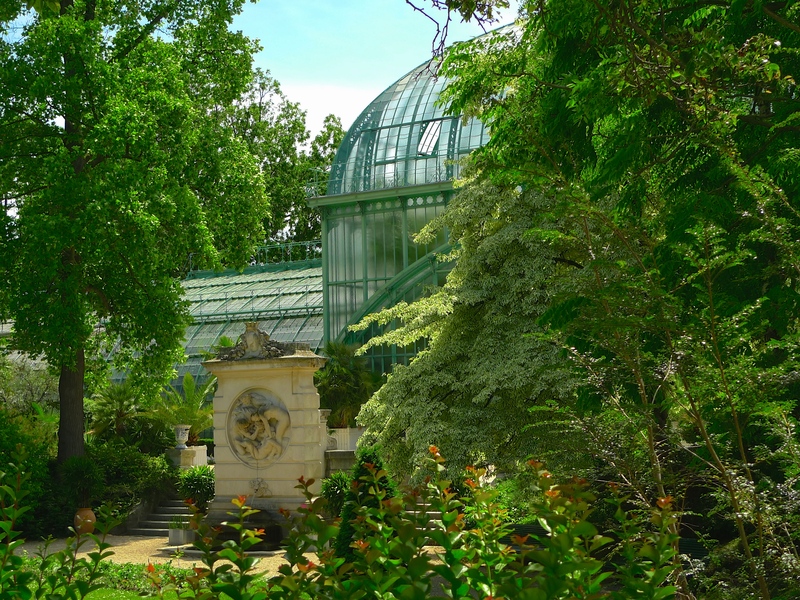 LOCATED AT THE southern edge of the Bois de Boulogne in the 16th arrondissement, the Jardin des Serres d’Auteuil is a botanical garden set within a large greenhouse complex. This garden, along with the Parc de Bagatelle, the Parc floral de Paris, and the Arboretum de l’École du Breuil, make up the Jardin botanique de la Ville de Paris, a collection of four gardens maintained by the city each with their own history and architectural and botanical heritage. The Jardin des Serres d’Auteuil was created in 1761 under Louis XV. The garden is arranged around a parterre in the traditional French style. 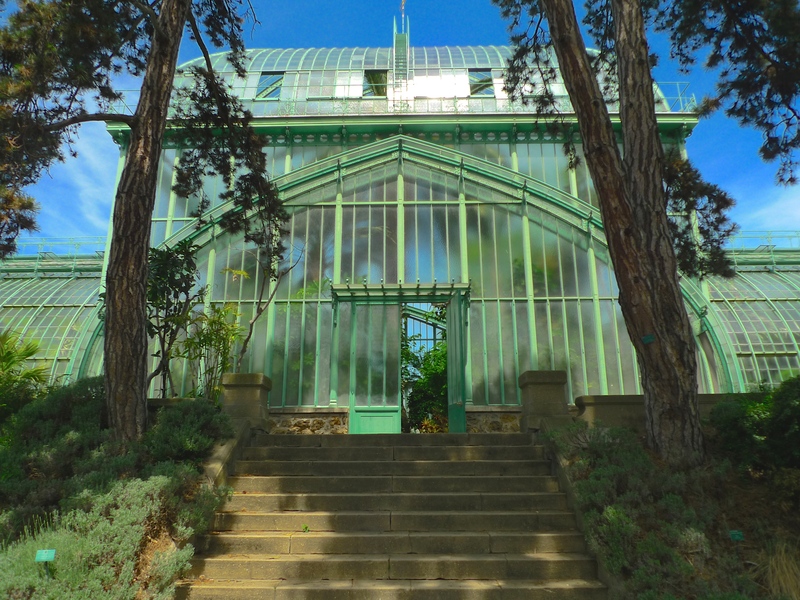 Today’s five main greenhouses, designed and constructed between 1895-1898 by the architect Jean-Camille Formigé were constructed around this central area. 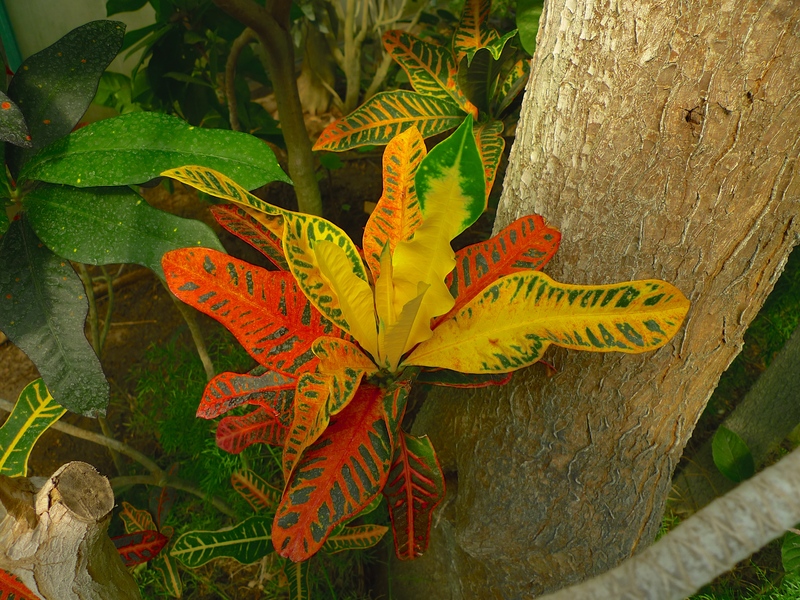 Among the botanical collection are many varieties of plants including azaleas, orchids, begonias, cactus, ferns and some carnivorous plants as well as trees of course. 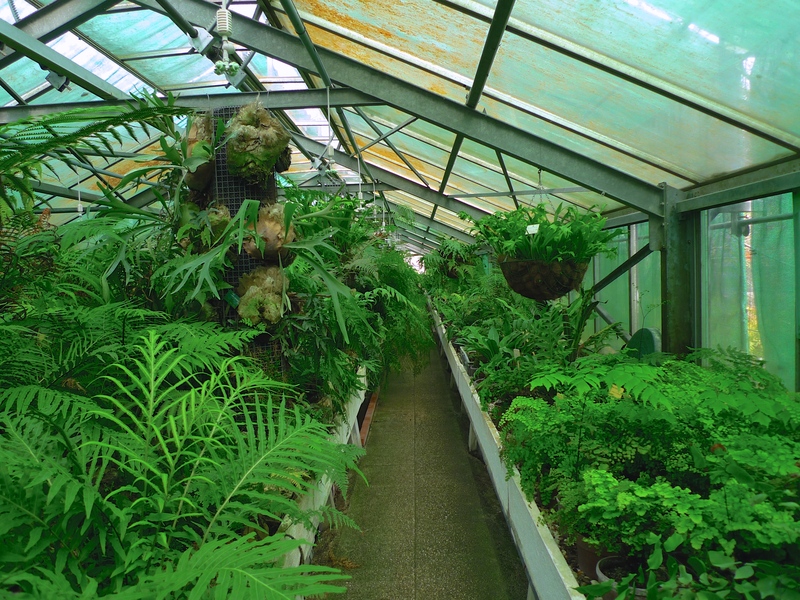 There is also a palm house and an aviary with tropical birds. 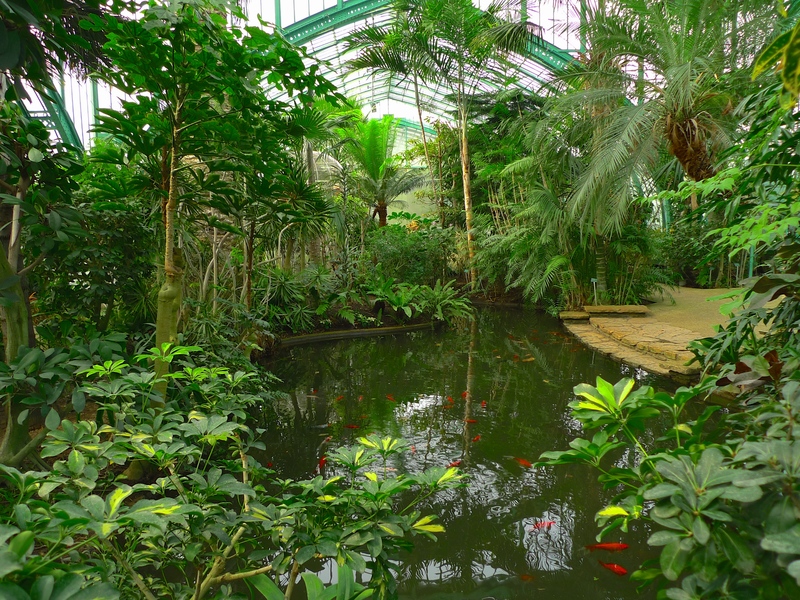 The Jardin des Serres d’Auteuil may be a relatively peaceful and tranquil oasis amidst the hustle and bustle of a busy city but the impact of urbanisation has left its mark. The building of the Boulevard Periphérique, the Paris ring road, in 1968 and the subsequent development of Porte d’Auteuil reduced the size of the garden by about one-third. The environmental impact of the traffic on the northern side of the garden where the Boulevard Périphérique and the A13 autoroute pass close by is hard to ignore. On the day I went, a grey mist hung in the air from the traffic emissions and the vehicular noise pollution not only pervaded the air but penetrated deep inside the greenhouses. A little respite from the worst of the noise pollution can be found inside the grande serre, the largest of the greenhouses. 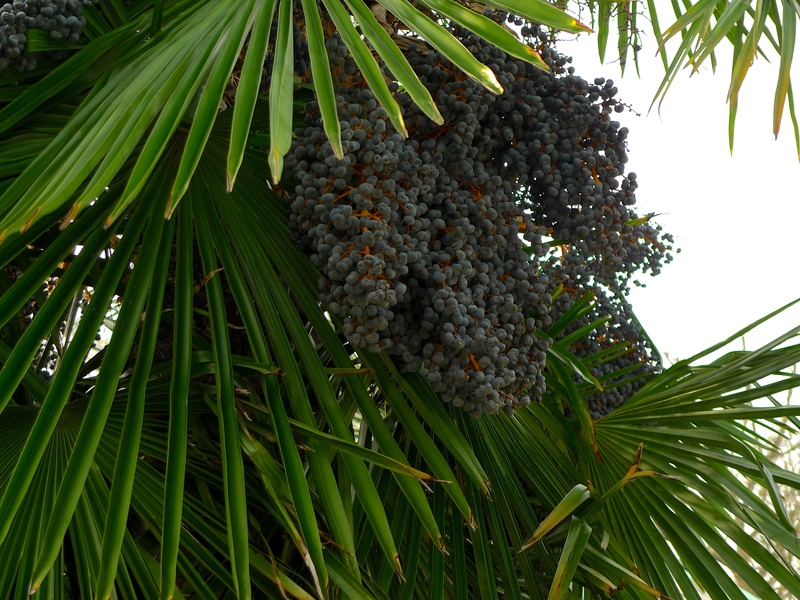 In here, the unwanted man-made sounds can still be heard but they are overtaken to some extent by the sounds of nature – the sounds of tropical birds. Standing under the high domed roof of this huge glass building surrounded by the sounds of tropical birdsong and with over-size fish swimming in the pool at my feet, it was hard to imagine that the Jardin des Serres d’Auteuil is again under threat, this time from a neighbour who slumbers peacefully for most of the year but for two weeks at the end of May and the beginning of June each year bursts in raucous life. The neighbour in question is the Stade Roland Garros, an international tennis complex, home to the Fédération Française de Tennis and to the French Open Tennis Championships. Along with the Australian Open, Wimbledon and the US Open, the French Open is one of the four prestigious Grand Slam tennis tournaments that take place each year. Some time ago, it became clear that the Stade Roland Garros risked losing its place as a Grand Slam venue unless it expanded to better cater for the needs of the tournament’s corporate sponsors. Not wishing to go the same way as the now defunct French Formula 1 Grand Prix, the Fédération Française de Tennis hatched a plan. Rejecting an option to build a completely new venue outside Paris at Marne-la-Vallee, Gonesse or Versailles, they decided instead to come up with a planned extension to the existing site taking it from the existing 8.5 hectares to 13 hectares. 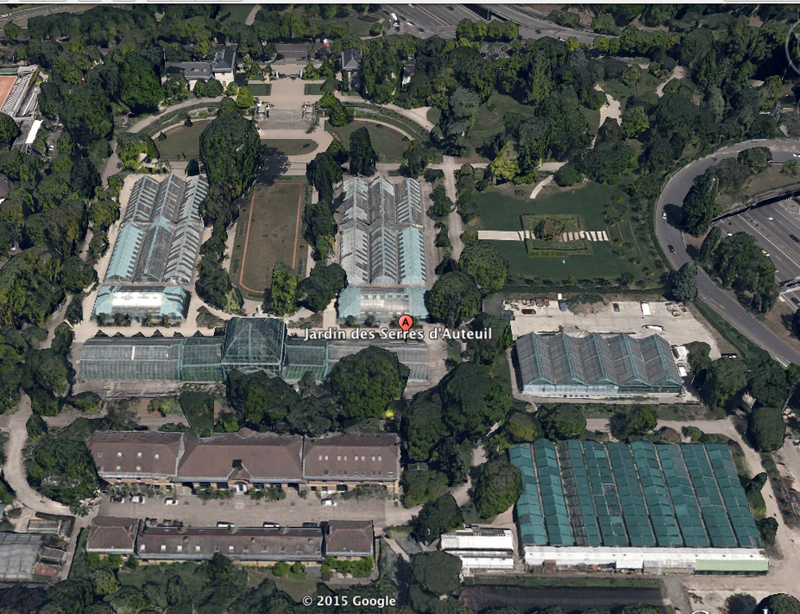 As you can see from this Google Earth image, the Jardin des Serres d’Auteuil and the Stade Roland Garros live cheek by jowl. 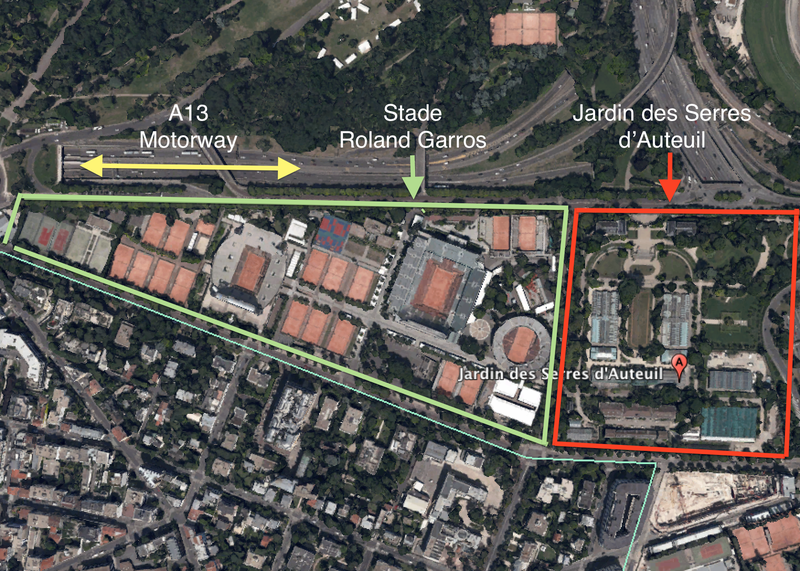 And yes, you’ve guessed it, the plan calls for an extension to the east into the Jardin des Serres d’Auteuil. The plan is for the centre court, the Philippe Chatrier court, to be given a retractable roof, while another, semi-sunken, court with seating capacity for 5,000 spectators will be built in the south-east part of the Jardin des Serres d’Auteuil. This will replace the current No.1 Court, which will be demolished to make room for a vast green esplanade spreading over a hectare – the new Place des Mousquetaires. The western side will see the Fonds des Princes having a new lay-out featuring a competition area with seven courts, one of which will have a capacity of 2,200 seats. 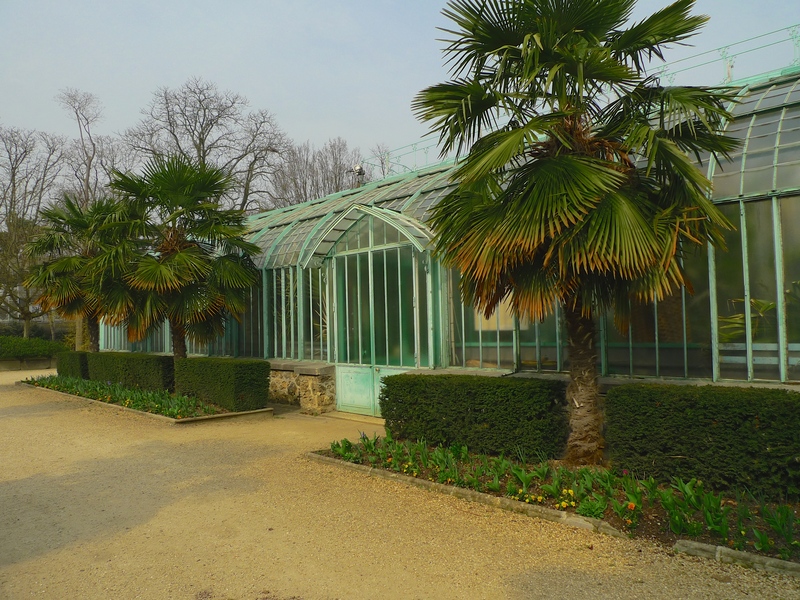 To accommodate the new court in the Jardin des Serres d’Auteuil the plan is to demolish the existing greenhouses and build new ones around the new tennis court in the same Formigé style. 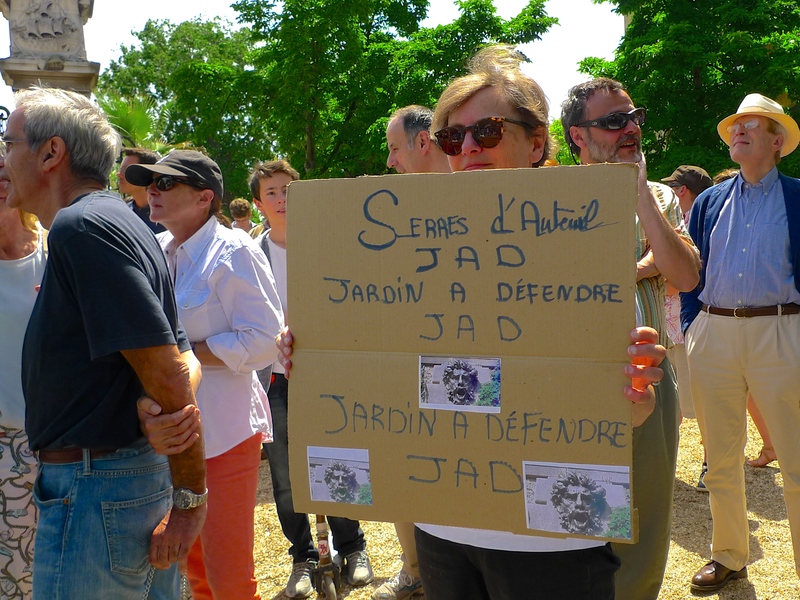 Local residents associations and supporters of the Jardin des Serres d’Auteuil of course are opposed to the plan and they’ve come up with an alternative. Instead of the eastward expansion proposed by the Fédération Française de Tennis, they have proposed an expansion across the A13 motorway. Their plan calls for the motorway to be covered and the new 5,000 seat court to be built on top of it so that the motorway passes underneath. The proposal to redevelop the Stade Roland Garros of course is not new, it was originally announced back in 2011. What is new though is that the Paris City Council, having originally supported the Fédération Française de Tennis proposal, has now put a spanner in the works. 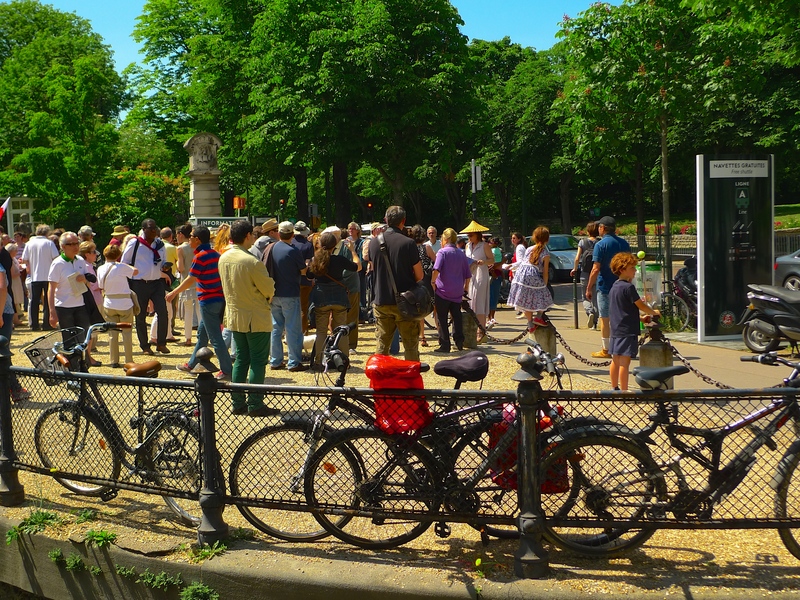 On Wednesday, 18th March, they unanimously adopted a resolution that a further study into the alternative plan should be conducted by an independent organisation, not by the Fédération Française de Tennis, so that the Paris City Council can debate and then vote on it. 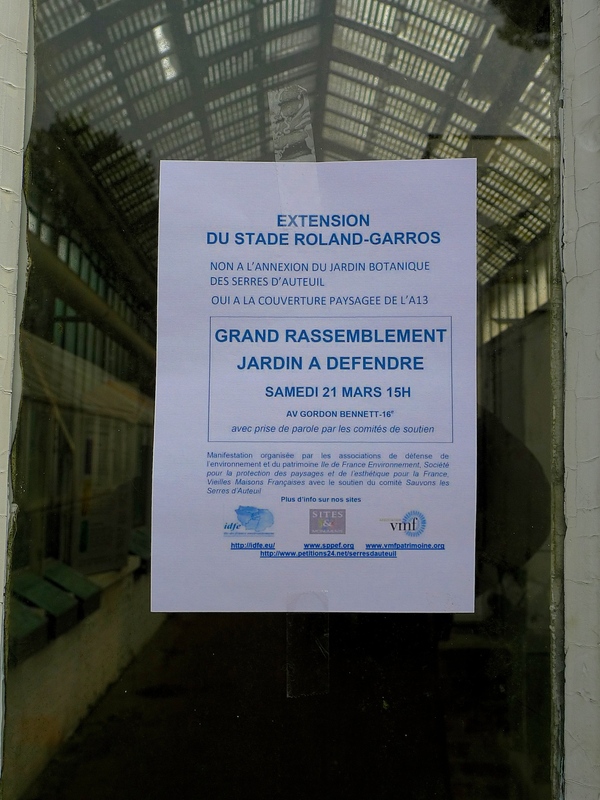 So maybe all is not yet quite lost for the Jardin des Serres d’Auteuil as we know it today. A notice on the door of one of the greenhouses shows that the fight goes on. 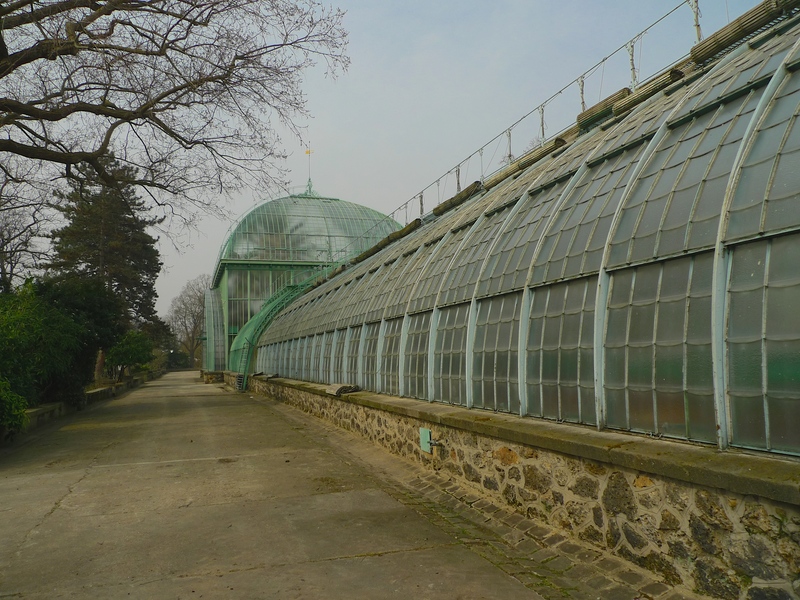 What the future holds for the Jardin des Serres d’Auteuil remains to be seen but, although I care about these gardens and think they should be preserved, I’m particularly interested in how the soundscape might change if either proposal goes ahead. If the decision goes one way and the A13 autoroute is covered we might at least get some amelioration of the vehicular noise pollution that pervades this space throughout the year and that will certainly change the soundscape for the better. If the decision goes the other way and a semi-sunken tennis court surrounded by 5,000 seats is built in the south-east corner of the Jardin des Serres d’Auteuil, not only will the landscape change but so will the soundscape. For two weeks of the year the sounds of cheering crowds, the endless grunts of tennis players, the clink of champagne glasses and the sound of cash filling the coffers of the Fédération Française de Tennis will no doubt dominate, but for the other fifty weeks of the year the reshaped landscape will inevitably create a reshaped soundscape. 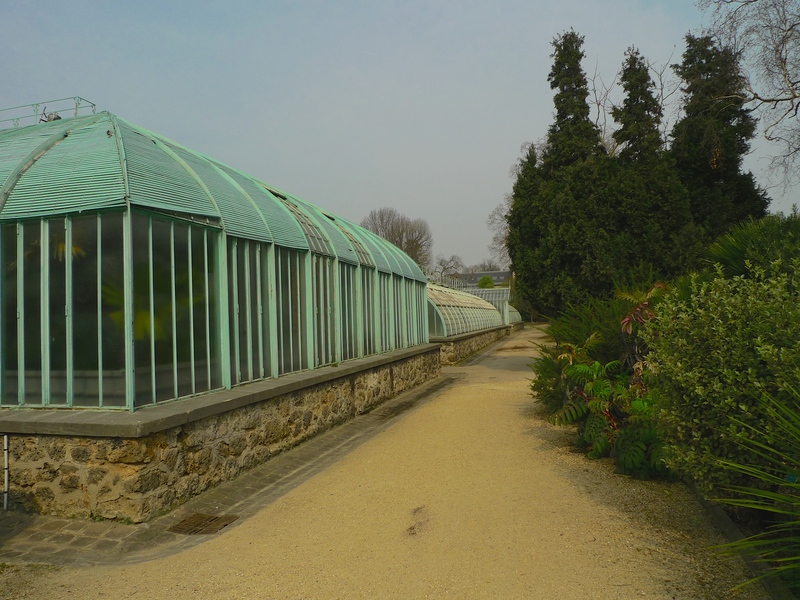 The existing greenhouses, including the grande serre, will be demolished, to be replaced by copies positioned around the new tennis court, which means that the existing sounds inside today’s grande serre will disappear forever. So it could well be that the sounds I recorded on my visit to the garden the other day will find themselves added to my ever-growing list of the vanishing sounds of Paris. Whatever the decision, and no doubt a decision will be reached eventually, I shall be there to record the effect of that decision on the soundscape. 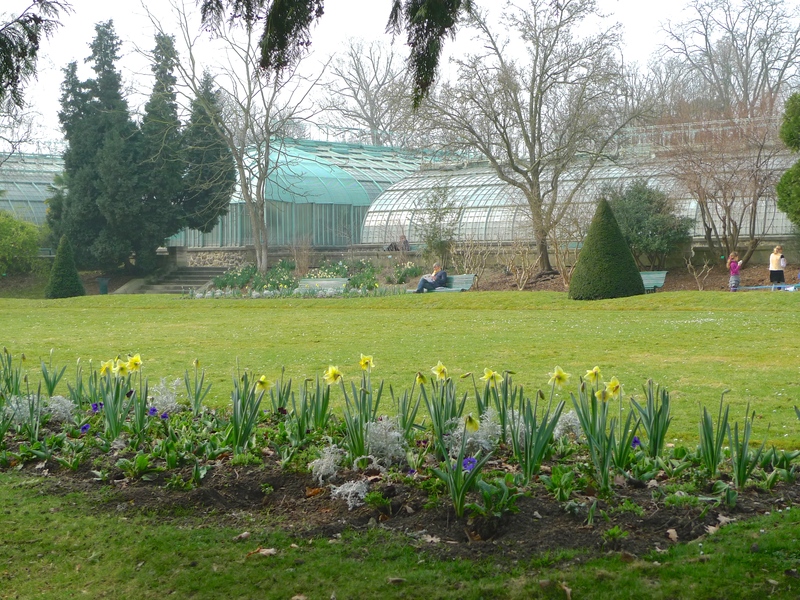 But, just in case Jardin des Serres d’Auteuil does disappear, here are some more sights of it as it is today.